We are finally heading towards our New Dimensional Space/Timeline, a higher one, where, some of us have been already transiting, anchoring ourselves and dwelling for a while. In this unique moment within Creation, as you already may know, we are the focus for many civilisations and non-physical beings, ones that have been assisting us in this quantum leap, and others, who are still trying to submit, manipulate and control our Planet. At this time, Forces of the Light and forces of the dark, are disputing for control over the Planet. We all know that in truth, the choice is within us all to finally end eons of manipulation and energetic control. Yours is also the choice to unite with one Force or another, for it is precisely free will that has brought us into this moment of bifurcation. 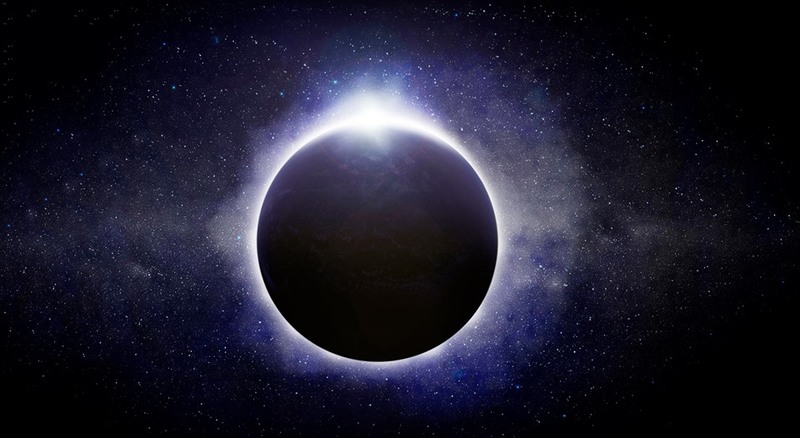 This New Moon Solar Eclipse at the critical 28 degrees Leo, will be the catalyst for all of us to choose; whether we keep fomenting the old or move forward within new horizons. This Eclipse will act as the consciousness awakener, something essential for the collective, especially for the ones who have decided to step into a Higher Octave. These fiery waves, will awaken new consciousness, will burn the ashes of the old, and if we are aligned with its frequency, we will be able to work on self-transformation, by inner alchemy - obtaining the purification required for where we are going. At the Eclipse time, we have the Moon and the Sun in Leo, who is all about self-empowerment and nurturing the individualized aspect of Creation, that we are. Leo is a very courageous sign, who loves himself and behaves as the empowered and Sovereign Being that He is, for He never forgets his true potential and Divine heritage. Leos stand firm in their own beliefs, honoring, and loving the self and their truth above all. As Leo also rules the heart, it is an opportunity for us to move beyond our limited sense of the self into our Higher Heart, where we will find the feeling of unity with All. Furthermore, we also have a Grand Fire Trine formed by the Sun, Moon, Mars and the North Node in Leo, Saturn in Sagittarius and Uranus in Aries. We not only have the blessings of the light Forces, working in our favor, but creative ones that - with this Grand Trine - are showing us from where true creativity, innovation and expansion comes from - an inner space of love for the self and All, as Leo reminds us, in which standing tall in our truth is essential. On the other hand, the North Node, representing the future, is a confirmation of where we are going, to a New Space of Higher Consciousness - whose frequencies are already being strongly felt/integrated. Having the Eclipse in the critical degree of Leo together with the awakener Uranus, in an exact trine to the Eclipse, is going to be pivotal in a massive planetary awakening. For it is at this time that more and more souls are beginning to recognize themselves as Masters, Healers and Sovereign Beings of their own life experience and hence, leaving behind an old era of mental and emotional slavery. Remember Beloveds, breaking free is done on a daily basis, this is not easy, for it is challenging to end with eons, especially within our body cells, and emotional Plane, of manipulation and mind control. This is not a one-day process. Become your own caretaker, and have compassion for yourself, know yourself and body, know what you need at every moment to heal, rejuvenate and nurture yourself. This is not a race, but with just the desire of evolving, it will not occur, for inner work must be done constantly, as we are forever changing, and therefore, embracing a new and Higher Frequency. On a physical level, one of the many sensations caused by our integration process are: heart palpitations, anxiety, stress and even "depression". If not medical issues, this is asking you to destroy anything that still keeps you in fear and you are not allowing to come to the surface. These hidden feelings are buried so deep within your subconscious and emotional plane that you will have to bring them all into the light to be able to face and dissolve them. Stomach issues, are an indication of cellular releasing. Pineal gland activations are frequent, at this period as well, for we are going to receive many revelations for our journey as well as in assisting others. If you are experiencing an inner shift, which is similar to reprogramming yourself or purification work, then you must notice how your higher senses/chakras are not closed but working differently. Let them be, and do your inner work, they are also adjusting to a Higher Frequency, unknown for your lower self, until this moment. Physical sensations are not easy to share at a general level, for you are all unique and you will know what aspects of yourself need to be released. It will also vary depending on your unique soul role. I AM sure at this time of your ascension path, you all have embraced your shadows, become familiar with them and instead of being afraid of confronting the unknown, embrace it with courage, compassion and the love that you are and that instead of separating and judging brings All together. On a planetary view, the Grand Cross, happening at the time of the Eclipse, between Aries, Uranus, Venus, Squaring Pluto and Jupiter, will focus on the governments and on how they use their power. This may bring a crisis in the collective, but this is what will trigger the necessary change for a massive shift that could be hidden by negative events. This is - again - the required chaos that the Universe uses to create anew. As this Eclipse occurs in the fixed star Regulus, in the Heart of the Lion, we are invited to ask ourselves if we are placing our power, standing firm in it and healing, creating our soul desires and selfless assistance to All, or if we are giving it away, becoming powerless beings ruled by outer circumstances. Are you an independent, whole, and brave being who takes full responsibility for all you create? Or do you still put your responsibility on others? Do you know from where true royalty comes from? A space of total union with the Highest Aspect of ourselves from where we act at all times? Do you stand tall in your beliefs and share them? Or do you hide yourself with the many masks that your lower self has manifested - during all your human years - due to fears and many other forms of illusion? Do you play safe? Or do you choose new horizons, showing everywhere you go and everyone you touch who you truly are, standing tall in what makes you unique? And the most important question: How do you behave with those who - your lower self believes - have hurt you? How do you treat them? How you react or not, demonstrates if you remain in your power. A Sovereign Being, will not react, or walk away, or reply in any way. Why? Because he/she remembers that one only walks in Truth, integrity and self-empowerment, when one simply rules their own being and power, and hence, dissolving anything that is not vibrating at the same level. Do you stand tall in yours? Or do you still choose to engage yourself within lower frequencies? True Divine Royalty, comes from remembering our God Essence within, not from violence, not from believing that we are better or superior to others. Feeling Royal comes when one finally realizes that we belong to a Higher Consciousness, and that if one belongs to It, All belong as well, hence, you too see them as powerful beings and not as hopeless unconscious ones. When this occurs, your ego has played you again. And one must begin to re-program oneself again, for our mind is like a machine and it is only by constantly reprogramming - that we can get rid of old beliefs. Angels in disguise walk among us. There was never a time within our Planet, in which we have been assisted by so many Light Beings, invisible to our human eye, most of the time, but very real Presences taking care of ourselves, watching over our ascension path and assisting us in all they can, within this free Realm. Your task is to integrate these energies, ones who burn, dissolve the old and help you to begin anew again. Your mission is not to ask for forgiveness, neither is it for you to trust in outer forces, people or circumstances. Your main aim is to BE - and to transmute what you feel is not serving you any longer. You are not here to simply ask Higher Forces, and wait. You were placed here, to remember, to assist, to stand tall in your Divine Power and truth, in who you are, and in creating anything you desire to experience. When one of your creations, does not work, then we re-align ourselves with our true soul desire and try again. For we know that we are the only ones responsible for resonating - or not. This moment, as there is no other moment in truth, is being given to you to honor yourself, to see all you have walked, and all you have achieved. This is not a time to feel unable to evolve, to trust in the outer, to mourn all that have left you, for it was doing you a favor, whether you believe it or not. This is a unique time - within Creation - given to you for you to embrace it, absorb it and step within full responsibility. Are you fearing it? Or will you finally embrace a Higher Way of existing, even though unfamiliar? At every moment, we all are given a precious gift to awaken, to evolve, to heal and to clearly see what we need for our journey. You have a special moment - in your hands - to stop paying attention to who you are not anymore, to release an old self and to embrace your true unremembered one. You are not leaving anything behind, for you are stepping into a unified path, where all is One. However, embracing and thanking the blessings of being an individualized aspect of Source incarnated as X, is wondrous and required, while we keep escalating within this eternal evolutionary experience. Enjoy it, respect who you are, for it is God living through you. Allow yourself to experience a journey of infinite expansion and self-discovery. For when you send the Universe your pure intention to do it, new doors will open for you to choose one. New timelines that were unseen for you - before - will be available, and with it, the opportunity to experience a new journey filled with many revelations that will lead you, step by step, to where you are meant to be. It is not a moment for you to worry about who will be there for you or not, this is not about you, this is about a Highest Will, and all you need is yourself, trust in the Divine and a will to open your heart to experience all that your United Self has prepared for you. Portals are opening, as we get nearer the 5D Space in which we are going to dwell. Move within, commune with your soul, release all fears and choose your own door/timeline. May you always dwell in the Illuminating Presence of your Soul, Beloveds, where clarity, peace and infinite love is always there for you to embrace it. Happy Eclipse!